As disappointing as it is, Halo 5 deserves commendation on its gameplay alone, as that is what carries both the multiplayer and campaign portions. 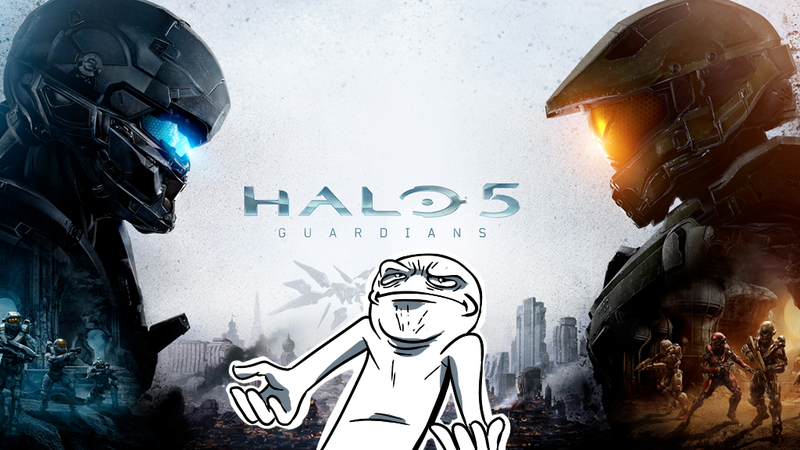 The latter in particular serves as a perfect showcase of why Halo 5 is so much fun to play, yet not to watch. Developer 343 Industries has nailed what feels like a natural progression of the series' gameplay. The campaign captures that same "sand box" feel, but adds more layers with new mechanics like boosting, hovering and clambering. Not only do you feel more versatile, but it allows for a greater amount of tactical choice, often rewarding experimentation. Similarly, weapons and vehicles feel incredibly balanced, favoring no one play style. Driving the Mongoose may have once been the proverbial "short straw," but it's now as enticing as it is different from the Scorpion tank. There felt like a situational use for most everything, even the once worthless SMG, giving Halo 5's missions a lot of replay value. However, as mentioned previously, the campaign's narrative does not hold the same appeal. If you were expecting a story of Master Chief going rogue and the subsequent "hunt for the truth," you won't find it; while the actual narrative is serviceable, it's a bit by the numbers. Halo's lore and its characters give it a unique flavor, but it's a familiar story of someone with good intentions pursuing power and as a result becoming the villain. What really makes the plot drag though is how poorly several of those characters resonate, particularly Blue Team and Locke. Besides lacking any significant play time to develop them as characters (Blue Team and Master Chief are playable for only three of the game's fifteen missions), the game relies too heavily on the player's knowledge of the extended universe. One otherwise would have little understanding of either Linda, Frederic, or Kelly's actions. They only feel included because Master Chief's levels needed three more avatars. This feels especially so when compared to their counterparts, Team Osiris (minus Locke). While neither Tanaka's, Vale's, or Buck's backstory is ever fully explored during the narrative, you at least get hints of their histories that make them far more compelling characters. There are some equally interesting references to Locke's past, but likewise they're never explored. Yet while the others seem to have charisma and unique perspectives of the transpiring events, he comes across as wooden and with no motivation greater then that of a soldier following orders. Besides its storytelling issues there is little else to knock Halo 5 for, as the same gameplay that shines in the campaign does so as well in Multiplayer. All of the previously discussed mechanics carry over and the fact that now everyone is capable of them makes for a more complex meta game; the overall sense of balance between weapons and vehicles persist as well. Better yet such elements feel largely unadulterated, as Halo 5 avoids the perpetual tinkering and level based disparity of other class based shooters. Halo 5's multiplayer manages to cater to a surprisingly wide range of tastes and moods. WarZone's a twenty plus minute slow burn that aptly mixes team based objectives and A.I. opponents. It's a nice contrast to Arena's various modes, which can scratch the itch for something more fast paced and competitive. So while aficionados of the series' lore may not be left satiated, Halo fans can take comfort knowing 343 Industries has in other ways raised the bar for itself and console F.P.S. 's overall.